A family was left dumbfounded when they were presented with their six-year-old’s maths homework. The question requires kids to identify the missing letter in a diagram. 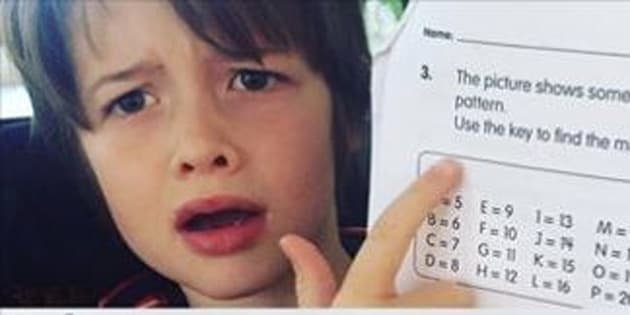 The mum explained this question was the final page on a seven-page homework sheet, adding that the previous six pages were “much more normal” for a six- or seven-year-old. “I’m 40 and my brain cannot bend in these ways,” she wrote on Facebook on 10 January. Using the key, the majority of people on the comments could see that B = 6, S = 23, P = 20 and G = 11. But that’s the point at which they become stumped. Thankfully there were some commenters there to solve the problem. James Nantz commented on the thread with a possible answer. “The answer is J = 14,” he wrote. “ It is a complex math question that requires you to substitute the letters with numbers. “You take the value of the S, B, and G and add them to get 40. Then you subtract the values of B and P from 40. Heather Combs Dutton also agreed the answer was 14 and even drew a diagram. “While I agree this is too advanced for a first grader (my seven-year-old niece would not understand this complexity at all); I still had to solve it,” she wrote.